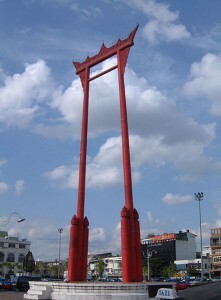 The Giant Swing was originally constructed in 1784 in front of the Devasathan shrine in Bangkok by King Rama I. After Brahma created the world he sent Shiva to look after it. When Shiva descended to the earth, Naga serpents wrapped around the mountains in order to keep the earth in place. When Shiva found the earth solid, the Nagas moved to the seas in celebration. The Swing Ceremony is a re-enactment of this story. The pillars of the Giant Swing represent the mountains, while the circular base of the swing represents the earth and the seas. The Giant Swing is near Wat Suthat Thepwararam in Bangkok.